Where can I look for your previous work? For client convenience, we have put Portfolio page on our website. Here we have updated our few projects. We have served over 500 projects in web development, SEO, mobile application development, Ecommerce, graphics designing and online reputation management. If you want to see our recent projects or want to know more about services then feel free to contact us any time. We always welcome new queries from our clients. What technologies are you using for Web Development ? We give preference to develop websites on open source technologies including PHP, HTML and SQL as they have great scope in present time. We are expertise in developing CMS based websites on WordPress, Magento, Opencart and Joomla etc as these platforms are free, easy to operate, cost effective, great plugin support and offers extended functionalities. Besides these we also design stunning websites in ASP.net and Sharepoint etc. Are you offering Search Engine Optimization Services? Yes, we are offering SEO or search engine optimization services to promote websites on Google and get 1st page ranking in Google and other search engines. We used to do proper keyword analysis for website and also work according to clients given keywords. In our package we include both onpage and offpage optimization for website. If you want to know more then please feel free to contact us.um fugaetam. Can you give suggestion or help me to know about my exact requirement ? We always help our clients and are ready to hear from them 24*7 hours. For any help or assistance feel free to contact us by email or phone as per your convenience. Do you work for international Clients ? Yes, we work for international clients. Our most of clients are from Abroad and rest is national. We offer our services all over the world. Recently we have activeclients from USA, UK, Denmark, Russia, Italy, Singapore, Australia, Israel, Malaysia, Slovakia, Germany, Canada, Columbia, Belgium, Nigeria and Spain. What is your Working Procedure ? We have expertise team of Developers, SEO and Programmers who work to bring best results for our national as well as international clients. Our working style is so simple to give more productivity. Clients can ask any query regarding to his projects at any time. We remain in contact or make conversation with our clients through video calling (Skype), email, phone and online chatting (MSN and YIM). How much do you charge for your services ? Our Pricing range is variable as per client’s requirement. We have defined packages for our services with different features. We offer fair pricing for every client. For more price quotations or know about our packages you can directly contact us on company email. How much time do you take to design websites ? Do you provide Website Maintenance services ? Yes, we offer Website Maintenance services for all of our clients. They have to provide cpanel details and the new point they are looking for change. What Services do you offer for clients ? 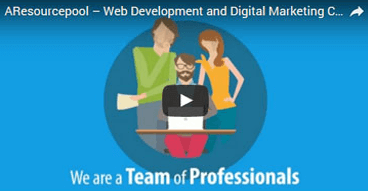 Want to Design your business website? We at AResourcePool develop client driven websites for small to large scale organizations to meet with user challenges. Are you thinking about business Branding? We help enterprises to tell their company’s story with custom logo design, professional brand development and corporate identity services. Want to boost website ranking in major search engines (Google, Yahoo and Bing)? We offer professional SEO services to increase your website ranking and online visibility.